West Brom boss Alan Pardew has vowed Albion will go on the offensive to save their Premier League skins. The Baggies will go half a season without a top-flight win - 19 games - if they fail to beat Arsenal at The Hawthorns on Sunday. 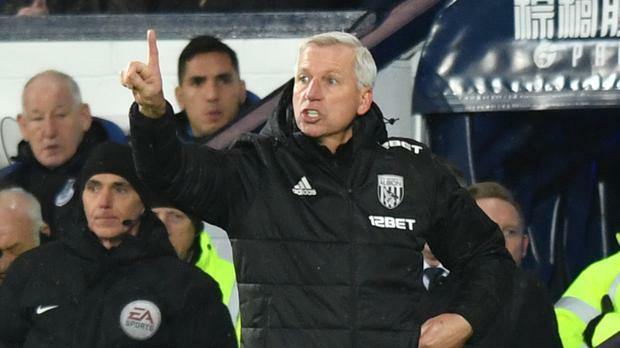 They have not won in the league since August and sit second bottom before the weekend's fixtures, and Pardew is eager to see his players attack. "We need to deliver with a risk-taking agenda. You can't win games if you don't take risks and this team was definitely on low-risk football," Pardew said. "I'm trying to change that and we're definitely taking more risks now. I think that will reward us in the goalscoring column and hopefully not hurt us where we've been really tight. We've had three clean sheets since I've been here. We're really sound at the back." Arsenal beat Crystal Palace 3-2 on Thursday but Pardew is taking comfort in his former club breaching the Gunners' backline. He said: " The (Arsenal) front three is world class, you could take that to the World Cup and any national team would be happy. That's what we're up against. More importantly for us we've got to score at the other end. Palace scoring two goals and getting some chances was a fillip for us. "We take that into the game. Hopefully we can get a couple of goals which is what we're going to need - at least - if we're going to win. "Of course every game it gets more and more important. Our fans were brilliant against Everton, if they can turn up and be like that again I'll be overjoyed. "Hopefully we can reach the same level of performance, it won't be many times we play like that and not win. If we can recreate that, we'll make our own luck."